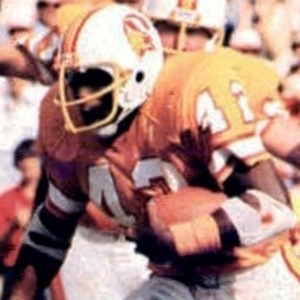 Running back who was the first overall pick in the 1977 NFL draft. He was an outstanding college player at USC, where he led the team to a National Championship following the 1974 season. He played in the NFL from 1977-1982, for the Tampa Bay Buccaneers, and the San Diego Chargers. He was born in Houston, Texas, and died in Los Angeles, California. His life was depicted in the film "A Triumph of the Heart: the Ricky Bell Story," where he was played by Mario Van Peebles.